In 1973, Glade began silver-smithing professionally. Soon he moved to Park City, Utah to work as a designer-goldsmith. In 1978 he took his skills to Sun Valley, Idaho where he expanded his interests to sculpture, to include such mediums as precious metals, bronze, fossil ivory, and stone. In 1982, Glade moved to the Caribbean island of St. Croix, where he owned and operated a custom jewelry and art gallery at a seaside resort. Returning to Idaho 1988, Glade made his home in the west central mountains of Idaho where he continues to make unique jewelry and sculptures. Glade’s jewelry has been collected by hundreds of discriminating buyers from around the globe, among them Stephen and Tabitha King, authors; and the Hemingway family. Sculptural pieces have been commissioned for the CBS movie “Dreams of Gold” (the story of a treasure hunter, Mel Fisher); The National Theater Workshop for the handicapped (Belfast, Maine campus); Fly Rod & Reel magazine’s “KUDO” award; as well as private collections around the world. As a young man looking over the gaping pock mark scar of the Bingham Canyon mine where I worked for five years in the 1970’s, I longed to do something that would put back some of the beauty that had been ripped from the earth. That’s when I began to teach myself the art of silver-smithing. It was a good feeling to know that as the ugly pit continued to spiral down into the earth… I was on a path to spiral beauty back into the world. My work is still inspired by the beauty of nature, symbolism, the power of personal sentiment, by the voice of the stone being featured, and of course, by the enormous power of spirit. My greatest joy, however, comes from my three fantastic children, two sons, a lovely daughter, and my wonderful grand-daughter and grandson and their mom, and my loving daughter-in-law. What a proud parent and grandparent I am, for they are my finest co-creation and legacy. The Earscrew is a wonderfully light and comfortable piece that quite simply twists into the earlobe. Secured by the top element of the form, it spirals gracefully down like a loose curl of hair, framing the face in a most flattering way. You can select your pair of Earscrews from a choice of 18K White or Yellow Gold or Platinum. Choose from our standard selections in black or white pearls, gold, or platinum spheres in a variety of sizes. You can also explore other Earscrew options with us, by using your choice of faceted gemstones, cabochons and bullet cuts. The Arcanum is an elegant adaption of the Earscrew and beautifully captures the space within the spiral. 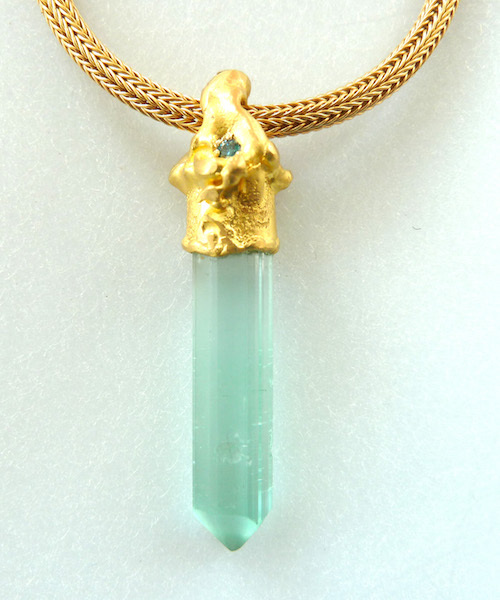 This central, sculptural element can be explored using different gemstones in variety of shapes and cuts. The latest addition to the original Thomas O'Donovan Earscrew exploration is the Sibling Collection. Have fun mixing and matching elements for a unique asymmetrical look to fit your style and mood! Nancy Linkin's passion for metalsmithing began over 35 years ago. She was captivated by the age old process of forming the metal directly with hammers. "The hammer is simply an extension of my hand..." Her exploration of the traditional smithing techniques, raising holloware and forging, started with traditional vessels forms. Soon she began to push the envelope both technically and visually, leaving the rotation form and functional form behind. Asymmetrical table top sculptures and wallpieces were a natural progression for her nature based aesthetic. "Natural forms have always fascinated and excited me: plant forms, earth forms, human forms." Sculptural jewelry was the next step, taking the sculpture off the pedestal and putting it on the body. Nancy did a series of one of a kind sculptural bracelets over the course of two years in the mid-1980’s. The tremendous success of this direction encouraged her to repeat the designs, adding earrings, neckpieces, and pins to her line of bracelets. Over the last 20 years the line has grown with over 80 different designs, each made in a variety of sizes, available in both a Sterling & 18K combination and solid 18K gold. To create each piece, flat patterns are cut from sheets of gold and silver and hammered systematically over specialized tools. Once a piece has been hammered into its final form, it's filed and sanded, then buffed to a high polish. 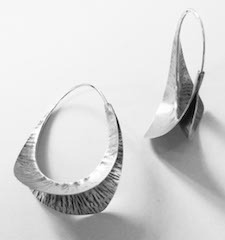 This fine finish accentuates the simple sculptural lines of her jewelry.